"O'Reilly 300" redirects here. For the Truck Series race in 1999, see JAG Metals 350. 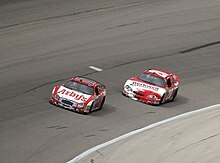 The My Bariatric Solutions 300 is a NASCAR Xfinity Series race that takes place each spring at Texas Motor Speedway, and was first held in 1997. In 2005, TMS was rewarded with a second Xfinity Series event in November, the O’Reilly Auto Parts 300. In 2011, the race became a Friday night race after being held on Saturday afternoon since 1997, returning to Saturday afternoon in 2017. Kyle Busch is the defending winner of the event after winning it in 2019. 1999 and 2002: Race shortened due to rain. 2010: Race postponed twice from Saturday to Monday due to rain. 2011: First scheduled night race in Texas Motor Speedway history. Carl Edwards gives the Ford Mustang its first Nationwide win since the introduction of the series new car. 2014: Chase Elliott gets his first career win and is the second youngest Nationwide Series at Texas with 18 years, 4 months and 7 days after Joey Logano. 2015: Erik Jones got his first career win after 8 starts and is the third youngest Xfinity Series winner at Texas with 18 years 11 months, 18 days, after Joey Logano and Chase Elliott. ^ Jayski's Silly Season Site (March 13, 2017). "Wise Health System to sponsor Texas' April XFINITY Series race". ESPN. Retrieved March 13, 2017.